When planning for vacation, deciding on the budget is not the most exciting part! But it is important to successful planning. After all, who wants to come home from vacation to work six months to pay it off? We’ve been budgeting for vacations our whole marriage, just like we budget groceries and other expenses. We might actually be better at vacation budget planning. Many readers have asked how to budget for vacation. So, here it is — our step by step method for planning a vacation budget. At the end of the article, I’ve also included a downloadable worksheet you can use to plan your vacation budget. Print it out as often as you want. Send it to friends. Pin it. It’s all yours! And it’s free! Now back to the vacation budget planning process. Step one is deciding the type of vacation you want and where to go. Got it? Step two is figuring out how much it will cost. If you have never looked ahead at expenses for vacation, it might seem overwhelming the first few times. But, I promise, after you do it once, it’s easy! And the peace of mind you get from knowing you can afford your vacation? Priceless! So let’s look at how you “budget” the general costs of your vacation. I’ll be using a 5 day vacation example through the whole thing to help you see how it works. NOTE: Resist the urge to book tickets or reserve a hotel at this point. This is the planning budget — to help you know what you can afford! How will you get there? When I plan a vacation within a one day drive of home (10 car hours), I compare the cost of driving to the cost of flying. Of course, the more people who go, the more expensive flying is. Likewise, the further away the destination, the higher the financial cost (and time cost) of driving. Formula: M (miles round trip) / mpg X $ (price of gas/gallon) = Total cost of gas for travel. 500 miles / 20 mpg = 25 gallons of gas needed. 25 gallons X $2.50 = $62.50 needed for car travel. This Fuel Economy Trip Calculator is a great tool to simplify this step. Then add in costs for toll roads if needed. This link helps make that easy. In our example, there are no toll fees. as a general rule, figure $20/person per full day of travel. If traveling with teens or others with large appetites, increase that budget to $25/per person per day of travel to and from the destination. In the example above, a 250 mile trip (one way) which is 3.5 to 4.5 hours of travel is, at most, one meal. For a family of four, I would budget $40 for this meal (half the daily food budget). Then I would double it for the meal on the drive home for a total of $80. if the trip will take longer than a day, factor in the cost of a hotel at $100/room per night needed (there and back). In the example above, an overnight stay would be unnecessary. Do you have to pay for parking at the destination? If traveling to a major city such as Washington, DC, NYC or San Francisco, factor daily parking at $40/day for the duration of your stay. Other cities might cost a bit less. Total each of these categories to estimate the cost of driving to and from your destination. In the example, our cost for travel is $142.50 (gas + food). If headed to New York City for 5 days, the estimated cost is $342.50 (parking for 5 days at $40/day = $200 in addition to gas for travel and food). Calculate round trip tickets within your half of the country (east or west of the Mississippi) at $300/person. Calculate round trip tickets across the country at $500. Factor in daily parking at the airport (anywhere from $6 to $15/day). For a family of four, the cost of round trip air travel would be $1200 + cost of parking at the airport. Also calculate cost of airport transfers to hotel or cost of rental car for the trip. I use a quick figure of $100 for airport transfers each way and $25/day for car rental (which is low). For a short trip like our 5 day vacation example, traveling by car is much cheaper. Hotels are the logical first choice for lodging. I search hotel sites such as Travelocity when making initial plans for vacation, but I don’t book until I have a working budget for the whole vacation. Then, I jot down the price of a few different hotels that meet our needs and use the most expensive hotel I’m likely to book for my working budget. That way I build in a little expense buffer! Factor an extra 10% of the full hotel stay for taxes. Then, look for resort expenses. Some hotels have them, especially those that offer more amenities. Does the hotel charge by stay, by day (most likely) or per person? Add in resort fees if needed. Example: Looking at hotels at the beach, I know I want an outdoor pool, easy beach access and some sort of dining option. I find three hotels that offer these amenities and have decent ratings: Hotel A is $140/night; Hotel B is $160/night; and Hotel C is $175/night with free breakfast and the largest room. I would use Hotel C for my working budget. 5 nights at $175/night = $875. This hotel does not require an additional resort fee. Total hotel working budget is $962.50. While you might not be able to budget food costs exactly, you should be able to determine approximately how much food will cost on your trip. Look at theme park restaurant menus or do an internet search of restaurants at your destination if you have specific restaurants in mind. TIP: If taking a “foodie” road trip, you might want to increase the food budget by 25% just to be safe. As a general rule, we factor $100/day for a family of four if breakfast is included at the hotel. We increase it to $150/day if breakfast is not included. In major cities and at theme parks, we increase our budget by $50/day. Example: Using the same 5 day vacation scenario with breakfast included at the hotel, I would calculate food costs at $500 (5 days X $100/day = $500). $160 + $60 + $160 = $380. Remember, this is the working budget for planning the trip. There’s no need to make reservations yet. We’re just trying to figure out how much the vacation will cost. Add all the costs from the above categories together to set your working budget for your trip. $142.50 for the cost of travel + $962.50 for lodging + $500 for food + $380 for extras and activities = $1985 total for vacation. Now that you have a vacation budget, it’s time to save and pay for it! When we know the expected cost of a vacation, we set aside money each month to pay for it. Our family goal is to vacation without carrying extra credit card debt. So, we take the total expected budget ($1985) and divide it by the number of months until vacation (usually 6) and try to set that portion aside each month. Example: $1985 total cost / 6 months = $331 per month to save. Another idea is to set aside money for vacation each month. Many banks offer separate vacation accounts. Check with your bank or credit union to see if they offer a fee free, interest bearing vacation savings account. Alternatively, set up an account through an FDIC insured online bank. Set aside a small portion of your overall earnings to save for vacations year round. Whatever you save in advance to apply toward vacation is money you won’t put on a credit card or home equity line. And that might be the best vacation “souvenir” of all! 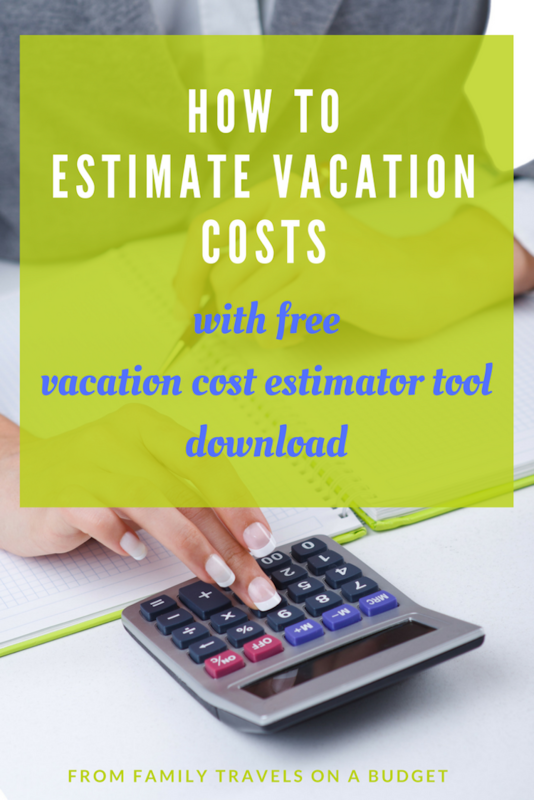 As promised, here is your FREE vacation cost estimator tool! So, do you budget for travel? Or do you just wing it? Or something in between? **This post was previously published on April 12, 2012. It was updated January 17, 2017. I don't remember where I found it, but I found a great form for planning a trip… just as you have outlined here. It was great! Gina, That’s awesome. I guess great minds think alike. I’ll have to search vacation budgeting forms and include a link here at the site. I am old school, believe it or not, and still keep my budget with pen and paper. Really! LOL – I love that you increase the food budget with Teens = they sure can eat you out of house and home! We are planning a trip next year and are investigating costs and planning now. We also use google alerts for information on sales going on now and for flights! We also coupon to save money and take mini trips. Good Post!! I always estimate expenses for our vacations, we are going to FL for a big 2 week vacation in 2014 and I am already saving for it now. It's only day two of the new site — you're among the first to visit! Please spread the word about the site — I hope it's a benefit to vacationers (or vacationing-wannabes) everywhere! Karen I love the idea of having a separate account for a travel fund! Great idea!! 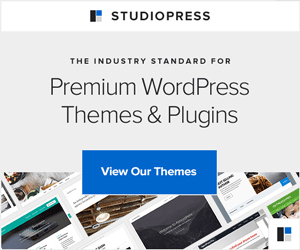 I didn't know you had a new site! I feel so out of the loop! Congratulations!!! I'm now following! Much love to you! I did not think of opening an account just for traveling. That should make it easier to see how much you have. Great tips! If I leave a question unanswered, be sure to email me at familytravelsonabudget@gmail.com. That's awesome. Isn't it rewarding to know the vacation is paid for without having to break the bank? Please let me know if you have any comments or suggestions to improve this blog.